I have a secret super power: losing headphones. Doesn't matter how big or brightly coloured the headphones are, I just can’t find them. You need your headphones lost? Come to me. I’ll help you out. Hmmm, well, people call me Scod, I suppose. I mean it’s not much of a nickname - it just sounds like my actual name, Scott, really. In high school they used to call me Eddie Edgar, which was cool. Before that it was Egg carton, which was less cool. Oh gee, that’s a hard one. I guess I worry that we will be silly with our planet and not take enough care of it. Also, I’ve spent a lot of time worrying that people might not like me or that I’m not cool enough. But, you know what? I’m a bit over worrying about that now. Once you realise that actually everyone’s standing around also worrying about not being cool enough, you start to feel a bit more relaxed. Comedy, stories, silly places, fun interesting characters, can’t count. Hmmmm. Oh wait, is 'Hmmm' one of the words!?! Wait, START AGAIN. Oh darn! Gee, I guess I’d love to be Sam Gamgee, from Lord of the Rings, who is loyal, brave and honest. But if you get me on the wrong day, I’m greedy and bad tempered, like Gollum. Probably, on average, I’m just silly old Gimli the Dwarf. I’d certainly like to see a dinosaur up close. But that was before 'years' were invented or had numbers attached to them. Does that still count? How would you even set the dials on your time machine!? I can't believe you actually ended up making books. That is mind blowing. Now, try not to be too much of a showoff, OK? My wife, Emily Fuller, who has all the good ideas in the family. Every time I do a drawing or write a story I’m always sure to show it to her and get her opinions, which are almost always incredibly smart and to-the-point. Hmmmm, I suppose I would have to say my Auntie Gwen. She used to give me wonderful books for every Christmas and birthday. I remember she gave me a book called Doctor Who and the Planet of Evil for my ninth birthday. It had a scary face on it so it took me a while to work up the courage to read it, but once I started, I was so sucked into it that I finished it in one night! That was it for me: I was off on a journey of space and magic and imagination that I’m still on today. Fleebenhorst. I just like the sound of it. By the way, if anyone knows what it means, do let me know. I’ve always wondered. I think you can guess that from one of my previous answers. That’s right! It’s Lord of the Rings, by Professor Tolkien! It seems like there’s a thousand stories nestled in that one book, so it’s pretty good value for money. 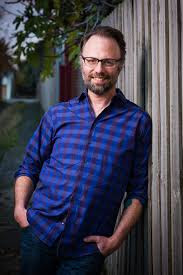 Scott Edgar studied Graphic Design and Theatre Production before embarking on a career as a composer, writer, comedian and actor, primarily in the comedy band Tripod. Tripod have been regulars on the international live-comedy circuit, radio and television, and have written musicals for the screen and stage. Super Moopers is Scott’s first book series as an illustrator. He has also written a book series, to be released next year. He lives in Melbourne. See www.scottedgarillustrator.com for more information.